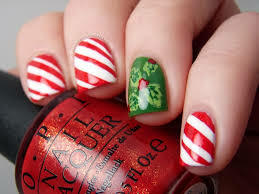 Nail care is very important, not only for visual reasons but for health as well. Proper nail care can help keep your nails not only looking great but free from fungal infections. Plus they should be considered when pairing up with your outfit choices ladies! Your nails are considered ‘healthy’ if they are smooth and are uniform in color. 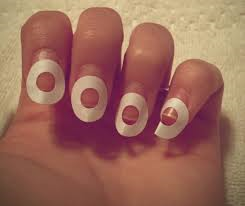 Healthy nails do not have ridges, discolorations or cracks. Here are a couple of tips to keep your nails looking and feeling healthy! After the nails have been trimmed, this is where I would suggest filing any jagged edges and uneven lines to give yourself a uniform look. I take a nail buffer, it’s a small object rectangular in shape with four sides to it, each with their own step. 1. Nail File, 2. Remove Ridges, 3. Buff & Smooth, and 4. Polish & Shine. MOISTURIZE!! Moisturizing your nails is very important, especially after washing your hands. You should always be in the habit of using a hand moisturizer after your wash your hands and rub some onto your nails. I usually keep hand lotion at my desk at work. Healthy nails require moisture, I moisturize through out the day with a cuticle cream and nail strengthener, plus my regular hand lotion. I swear by Body Shop Almond Hand & Nail butter plus cuticle oil. **Hot Tip** Pour some white vinegar onto a cotton ball and wipe down your nails, this will remove any oils or dirt that may be left over and will get you ready for polish. I use this before applying any polish to my fingernails. **Tip** Protein! I always use a protein treatment and apply it my nails before using any polish, to help keep my nails strong underneath the polish. If your nails are mostly healthy you can skip this step and go straight for your polish. I also take a lot of vitamins daily, I take Vitamin C, Calcium (great for strong nails) women’s mixed vitamins, Hair Skin & Nails supplements and Cod Liver Oil. Paper Hole Protectors cost only $1.39 from local store. Top Tip! My favorite colors this festive season are Red and Gold’s! 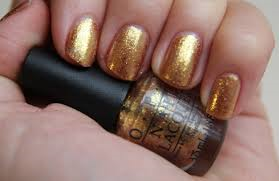 I absolutely swear by OPI Nail Colors (Golden Eye) or Revlon.